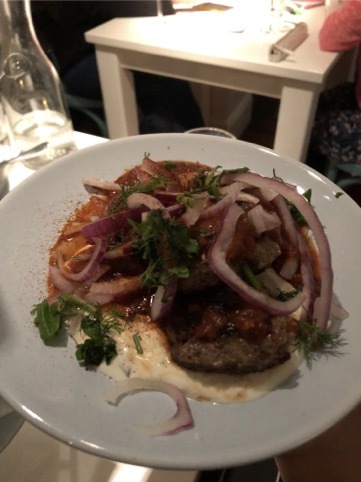 I have not eaten Greek food in a long time, so was pretty excited at the chance to dine out and to try some new and exciting flavours for my palate. 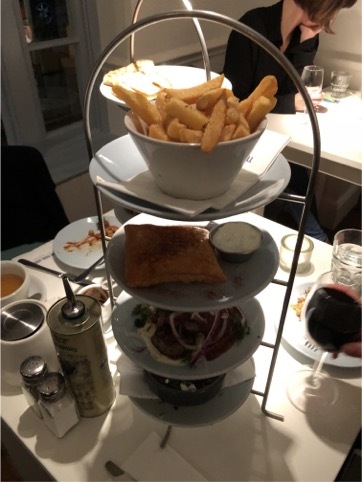 The new Real Greek restaurant is located in Dulwich Village which is about 10 mins or so from either railway station, and located nearby to a great pub The Crown and Greyhound (recently refurbished and back open once more). Inside, the restaurant is welcoming, and staff were attentive on entry. Wifi is free and available to login to use. The Restaurant is family friendly, and many parents seemed to be enjoying taking their kids for meals out, with the Dulwich Park nearby for a chilled walk outdoors. Entrance looks big enough for wheelchairs, however was unable to locate any ground floor based facilities, as toilets are located on the 1st floor. The restaurant starts to get busier from 5pm and has a steady flow of customers all the way to 8pm. Lighting seems to dim from 6pm, which whilst atmospheric for couples, may not suit all tastes. 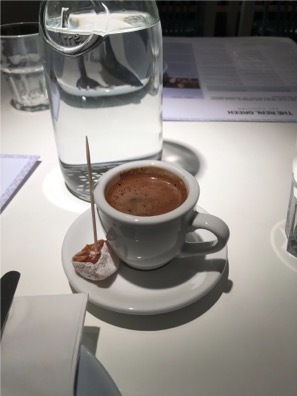 Whilst I was waiting for my friend I decided to order Greek coffee, which as you can see from the photo also comes served in an espresso cup with a delight. On the menu, the options to serve are sweet, medium or bitter. As I like my coffee bitter I went with that as my option. Great presentation, and even as a coffee this was a welcome change to try. However it was too subtle in its taste, and found myself wishing there was more body to the taste. Combined with the sweet delight it was a good aftertaste, and the caffeine was strong too. So for the food, elected to go for the Peloponnese for two, which offers an option of two on the menu. You will find this option under Perfect for Sharing. 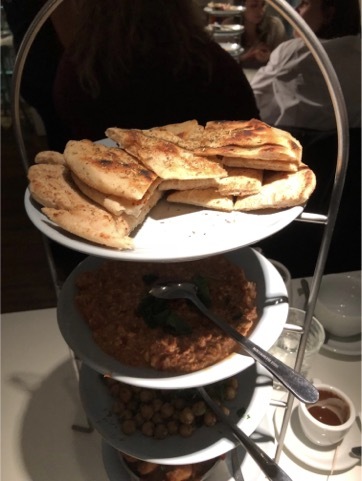 As you can see, although the tables are small, the dishes are served stacked in a nice metal frame, allowing the option to pull the dishes off to serve each other. The waiting team go through what they have presented, and are good natured to check in, to ensure food is up to standard, or offer any counsel to any questions. The Bread was warm, fresh and complemented the meal well, allowing options to try sauces with each of the dishes. I enjoyed the Spicy feta dip, the spices were great, and not too hot heat wise, and have always enjoyed a bit of feta. 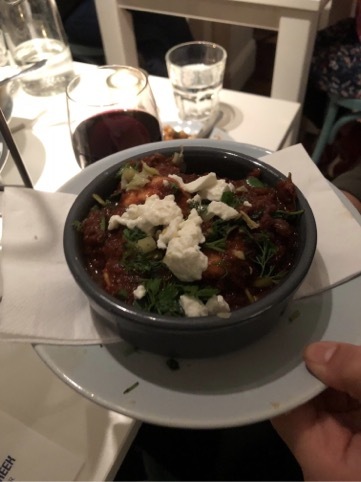 This was new to me, and hadn’t expected feta to be served in this manner. Another standout for me was the Lamb meatballs dish: these were great! The warming spiced meatballs with the crunch of the red onions gave a really nice texture to the whole dish. Now that I have visited, I’m excited about exploring more of the menu. The sharing menus are quite filling, and you can easily go without dessert, which I did! The menus appear to be designed around sharing, and that was what I observed around the restaurant, which is great. It allows the option of trying all sorts of foods. The manager mingled with new and regular customers. It’s located in a family friendly area, and although not open for long, seems to have attracted a following.